There is a little bit of a craze nowadays in what concerns small spaces. The recent housing crisis all over the world has enhanced the feeling that homes should go smaller and not bigger. And while bigger is not an option in the Netherlands, that unless we reclaim the Markermeer and the IJsselmeer, I’m not entirely sure that the small we should aim for needs to be that small. 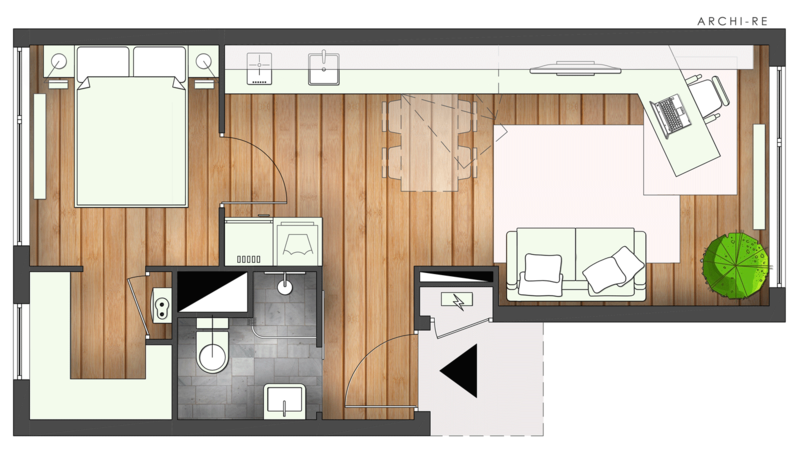 This is a small apartment, most likely the result of later divisions. This means that most of its elements were afterthoughts added in order to provide fast relief to whatever problem had arose. 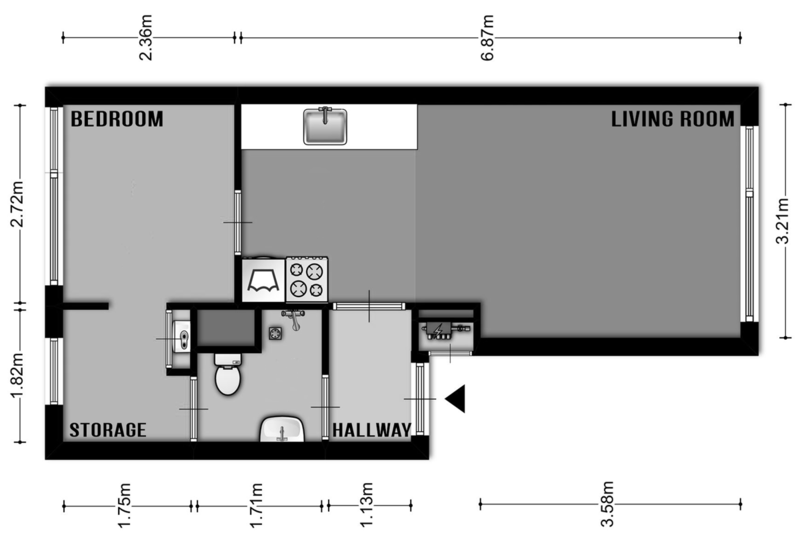 • The bedroom is incredibly small. It is large enough to fit a bed and a small walkway path around it. And while some would call it survivable, others would have fun with it and see it as the perfect stage for playing lava. • The smallness of the bedroom gets compensated by the adjacent space which makes for a perfect walk in closet. In conclusion, there is no space to waste here. • As previously agreed, we shan’t waste any space. Thus the second door to the bathroom was replaced with a precious piece of wall, allowing the proper use of the storage space as a walk in closet. Nice! • There’s not much to be done on the layout level of the bathroom. There’s plenty to try on an interior design level, though. Like adding a nice pop of color (or not) with a shower curtain. Besides the aesthetic effect it will also make sure one’s not drowning everything else while taking a shower. • This is the type of apartment that deserves custom made furniture. Something that has a lot of easily accessible yet hidden options, and that can house a dining table when not in use in order not to crowd the space. • Movable appliances in stead of fixed ones, whenever possible, is also a smart idea for such a space. And by now, there are plenty of affordable options to choose from. Like, for example, this IKEA electric cooking plate. • I designed here the most common option: a young person with a dynamic job. In this case, a home office is a must. I know that a wall facing desk saves space. It can however create discomfort if there is more than one persons living in that space. This is why I like to find options that allow one to visually connect with the rest of the space while working at a desk.